Buddy cop action films are a tricky bunch. They all have a common theme, and so it’s really difficult to rank them because sometimes they all just seem like the same thing rehashed a thousand times. That was my honest opinion about the first Lethal Weapon film, which I still hold firm, but there was something special about Lethal Weapon 2 that just feels right. When I think of this series, a lot of what actually happens in the movie is what my mind instinctively shoots to. So in short, that’s why I like this movie more than the first…but let’s break it down. One year later, Riggs and Murtaugh are clearly still working together and high in pursuit of a man with a ton of gold in his trunk. Well, because Murtaugh was the main man on the case, these South African diplomats send a team of criminals to his house to threaten him and his family, so the next day…he is reasonably taken off of the case. His and Riggs new case involves protecting a federal witness, which they take as offensive. Looks like they were really still on the case, because the thing this witness witnessed….had to do with the South Africans. 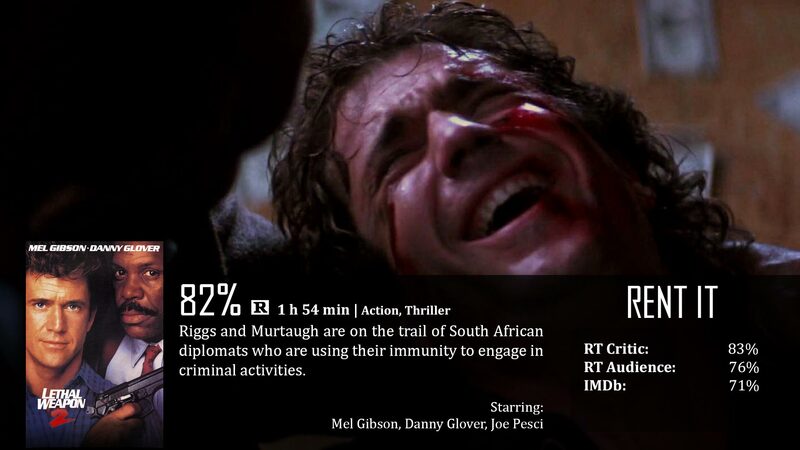 Turns out, these South African diplomats are wagging their diplomatic immunity in Riggs and Murtaugh’s face. Basically saying, we’re going to pillage and plunder all we want and you can’t do a darn thing to stop us. The plot of this film is so much better than the first one. They made South Africans look cool before District 9 took over the popularity. I’ve always been interested in the idea of diplomatic immunity and what that means for foreign crime. It has been used as a plot device in other forms of media, but it’s a more untouched idea with plenty of space for creativity and originality. Plus, you gotta love that funky accent the South Africans have. You know how easily this writers of this film could have chosen Russians, Chinese, or other diplomats? So easy, but everyone else has already done it, and it’s still being done today. South Africans? That’s awesome! Another aspect of this franchise that I remember well is Rigg’s wacky personality and dislocating shoulder. He’s crazy, and I love it. I love the fact that they were able to take his craziness from the first film, develop it a bit more, and made it make sense for the sequel. His craziness in the original film had a lot to do with his suicidal tendencies. This time around, it had a closer resemblance to say, the eccentric attitude that of Tony Stark in Iron Man. Everything else was purely just…memorable in general. The shoulder dislocation is a part of what makes Riggs unique and when people think about shoulders dislocating…at least half probably think of Mel Gibson first. The toilet bomb scenario is a hilarious scene and incredibly memorable as well. The Mythbusters even tested this very scene to understand the reality of what would happen in the same circumstance. Also, the romance between Riggs and Rika is a bit too James Bond-y, but at the same time…it was incredibly important for Riggs’ growth in moving on since his own wife’s passing, and her role is rather significant in the long run. So this is all fine and dandy, but how is it bad? I wouldn’t say its any bad for specific reasons, but I could easily see people looking past the film because it doesn’t really create a long-lasting effect. However, it is a lot of fun for when you are watching it. So there’s that. Mel Gibson and Danny Glover definitely play their strengths here once more, and their chemistry is off the charts once they are able to feel more comfortable in their roles. Their messages of anti-racism, teamwork, and friendship are impressive and admirable. The action is really great and the jokes are fresh. All around, it’s a fantastic movie to get lost in. Not too much is really bad here…it’s just not the most epic film in the world. You could easily forget all of the good the movie actually offers, which is a shame. Roger Murtaugh: Nailed you both! Agreed. Plot is better than the first. Villains are better than the first. Humor is just as prevalent.